and dried out from the sky lights in our living room. more so when she came home and saw the finished product. Our furniture looks like new again. 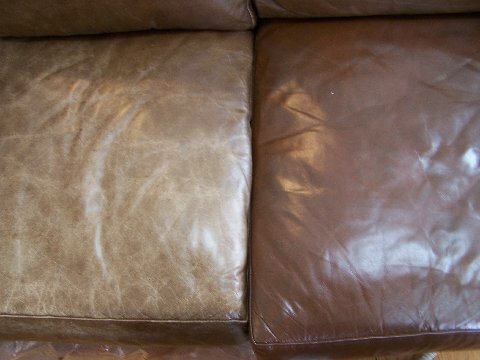 Total Leather Care replaced and repaired cushions on our leather sectional that were severely damaged by our new puppy. Refurbished the rest of the sectional. "This company and their team are highly professional and i would certainly recommend them. Our leather sectional was severely damaged and had shown a great deal of sun damage and leather cracking. We love the sectional and it would be difficult and expensive to replace. Total Leather Care came out and gave us a written estimate with a number of different options; there was no sales pressure. After we decided to contract them, they came out and picked up the sectional and then returned it as promised in two weeks. The sectional looks brand new and I can't tell you how pleased we are with the decision to use Total Leather Care. Even though the price seemed high at first, the results were well worth it. Compliments to Chris, who handled the estimate, pickup and delivery. Joan and Nicole in the office were very helpful and professional. 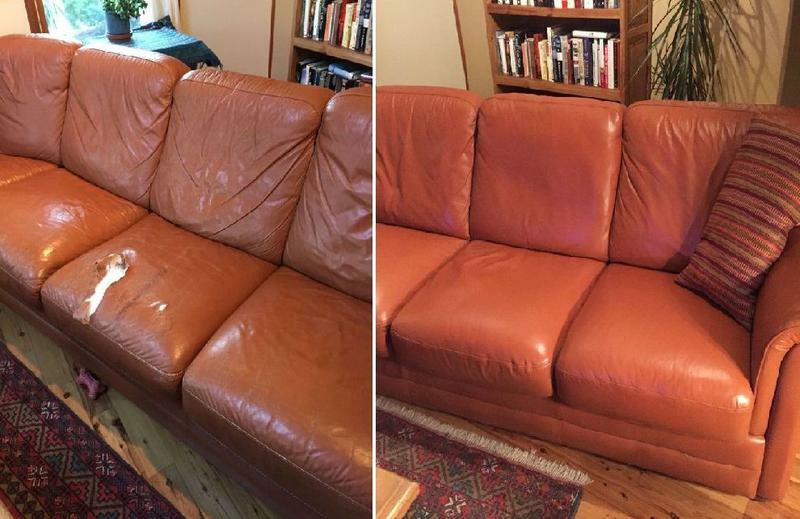 "We were considering replacing our 12 year old leather sectional because of all the rubbed off spots, and scratches from our dog's nails, but found Total Leather Care on line and thought we would try repair. Perry did a great job and the sectional looks brand NEW! Wish I had taken a "before" picture. Reasonably priced and saved us thousands of dollars in replacement costs. Highly recommended!" "I am totally happy with my "New" 10 year old leather furniture! I received professional, courteous service from a very helpful staff. The job which was extensive, a sofa, two easy chairs and an ottoman was done and delivered within the time proposed. My full recommendation if you are thinking of trying this company." "I had a great experience with this company. I needed some paint removed from my leather couch that have been stuck on for years. I emailed a few pictures of the couch to the company, and they promptly got back to me with what I thought was a reasonable estimate. They were out at my house within a week. The technician was very professional and obviously knew what he was doing. He immediately confirmed that he could honor the estimate given over email. Within about two hours, he had all of the paint, which I have found impossible to remove, completely gone. Moreover, the couch looked good as new. I couldn't even tell that there had ever been paint there. I would highly recommend this company to others." Just a quick note of appreciation for a brilliant job restoring our Natuzzi sectional sofa. We are very pleased with the quality of work and the professionalism shown to us throughout the process. Thanks again – I will share my experience if I run into anyone interested in a new sofa or restoration. Just wanted to thank you for the wonderful repair job on my burgundy recliner. My husband is very pleased with the workmanship, and I was happy to have it in time for his birthday! I appreciated your being able to complete the job in a timely manner. I would certainly recommend your services to others in the future. I hope all is well with you. I first want to thank you for assisting me in such short notice. The repairman that was sent to my condominium building was professional and did a fantastic job. I will be using your company in all of my condo buildings. Thank you so much. Have a wonderful weekend! Just a few words on the excellent job done on our Mercedes. Chris is an amazing person, very customer oriented, kind, responsive and friendly. You almost need a magnifying glass to see where he fixed the leather tear. He's the best. Please thank him for us. "I had to tell you what a wonderful, wonderful job Terry did yesterday and what a great guy. The sofa looks absolutely gorgeous, brand new, so excited. Now my other chair all of a sudden looks too dark. I would it to match my new beautiful sofa."